Experienced Horticulturalist and Garden Designer. Birdsong darts in and out between the rain clouds. 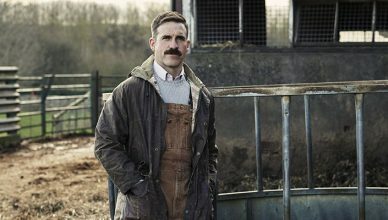 The fluted voice of the robin, whose cheerful melody lifts my spirits, is especially clear as I weed on the wet ground. Early spring is always a time for cheerfulness – much needed after the long dark months. The earth visibly stirs and the mornings are noticeably lengthening but the weather is still wet and cold. The robin’s song, though, says to me, Rejoice, for the worst is behind you. 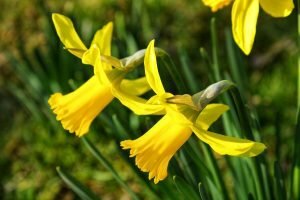 March is the month for daffodils, or Narcissus if you prefer the Latin. 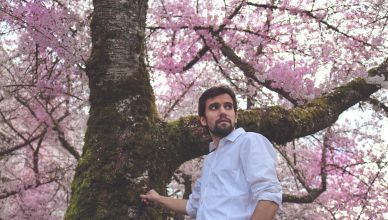 Although you may find some cultivars that will flower as early as Christmas and as late as June, March is their moment. 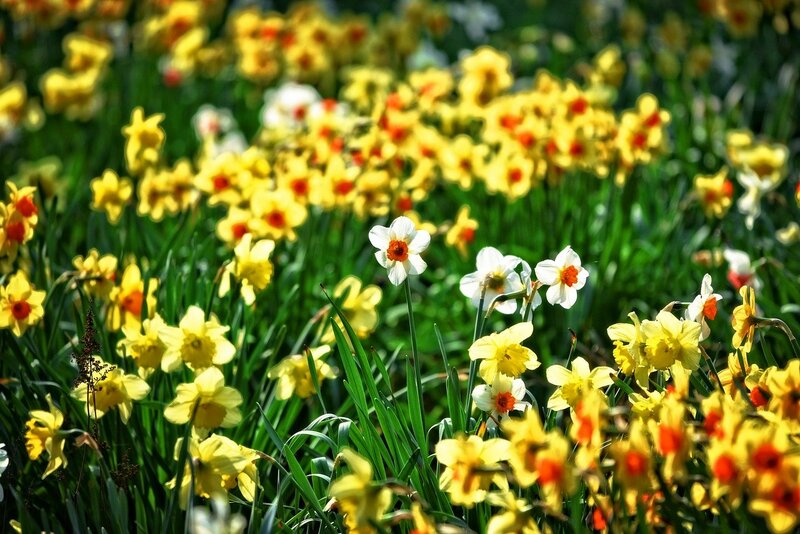 There are many types of daffodils, separated into 13 divisions according to their flower shape. 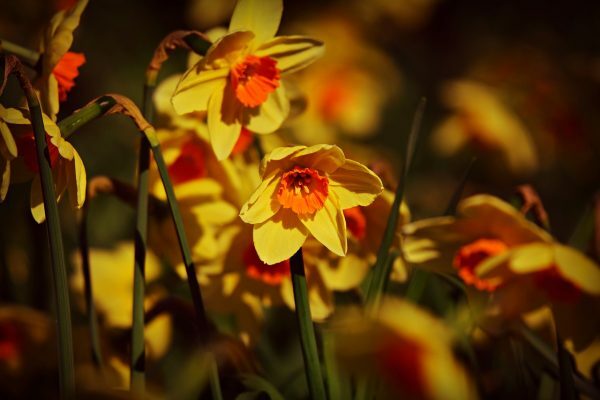 The larger daffodils with trumpet, cupped or double flowers are what most people commonly think of as daffodils. They make excellent cut-flowers and many were bred for the trade, but they also make good garden flowers as their height makes them stand out of the border in a jolly ensemble of yellow, gold, orange and cream. Try N. ‘Saint Keverne’ for a typical bright yellow and N. ‘Mount Hood’ for an off-white. Equally pleasing, but in a more demure way, are the smaller species types. These naturalise well in grass and will spread themselves to make a floral carpet if left to go to seed. 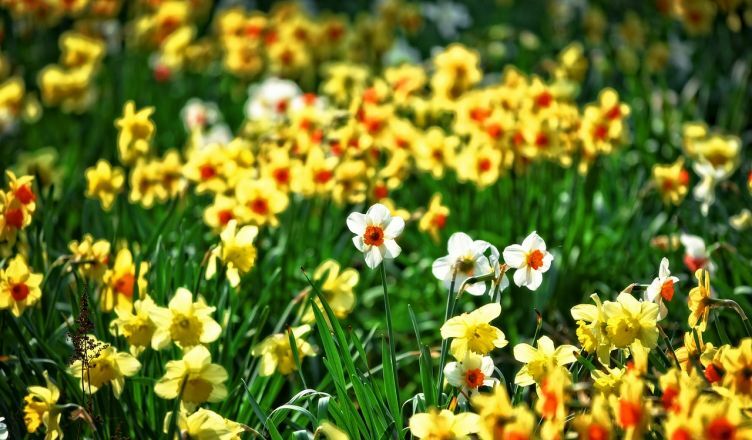 As with all bulbs, allow the leaves to die back naturally and go into summer dormancy before tidying up. This will mean leaving the grass long if grown in the lawn, but be patient and enjoy the lawn flowers that may arise. Some of my favourite types are the species N. cyclamineus, with reflex petals giving it a wind-swept look; and cultivars bred from it like N. ‘Jack Snipe’ with yellow petals and a lemon trumpet, or N. ‘Jet Fire’ with golden petals and an orange trumpet that’s not too bright. Other dainty species worth a try are fairy-like N. triandrus, and the cream and pale yellow N. pseudonarcissus, our native daff; or N. bulbocodium, the hoop-petticoat which wonderfully describes its funnel shaped trumpet, perhaps best grown in a rockery or a pot where it can have good drainage. 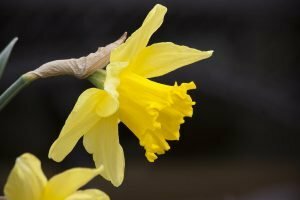 Most daffodils are easy to grow and return year on year to give a good show. Their bright faces always bring a smile. Early spring is a time of yellows and whites. Looking up from the bouncing flower heads in the breeze the yellow theme is continued, shining out from the bare branches of the trees against a grey sky. 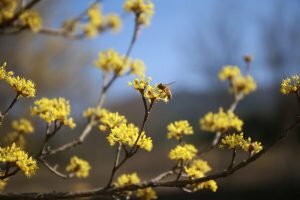 It is Cornus mas, a shrubby bush that will eventually form a small tree. The tiny golden flowers are arranged in clusters like little globes eventually to become small round fruits. It precedes the Forsythia, whose nodding flowers are well known. Every year I forget just how stunning Forsythia can be: for just a few short weeks it is lit up like candle light before retiring to a mass of green. 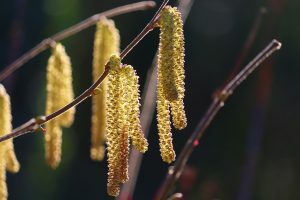 Also dangling from the tree tops are the long pendent catkins of the hazels. From tight green chrysalises they expand into golden tassels, releasing their pollen before fading roseybrown. Although we grow the purple Corylus maxima ‘Purpurea’ and the twisted Corylus avellana ‘Contorta’, I still prefer the straightforward species for a natural look. Coppice them every three years by cutting down all the wood to the ground. Not only does this control the height and create a multi-stemmed tree, but it also gives you useful poles for beans and sweet pea supports. The fresh new growth of leaves always has brightness to it so look to the trees and the hedges. I am also drawn to the Euphorbia amygdaloides a useful ground cover for shady sites. The flowers of this evergreen spurge are really its bracts and they’re a bright acid yellow which compliment the green shoots of a nearby current. Flowering currents have a countryside charm of their own. I like the reds, pinks and corals you can get, but for me the ivory flowers of Ribes ‘White Icicle’ offer a sense of purity. Behind a mature specimen of Pieris formosa var. forrestii grows. 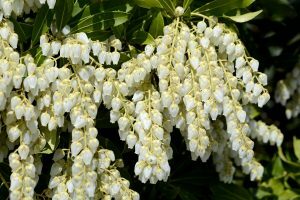 Now a small tree it is slow-growing but it is worth the wait as now its structural limbs are clothed in wreaths of cream coloured bells set against a foil of dark green leaves which persist throughout the year. It flowers for a long time and will probably see the neighbouring Magnolia stellata come and go, whose own fluffy buds are just waiting to spark into pale white stars. Another bird call joins us; this one sounds quite silly, reminding me of a slide whistle. Lapwings, come to pair up and nest in the surround fields. I always listen out for them and love to watch them as they flop around the sky in a rather chaotic, wheeling flight – an aerial display designed to attract. 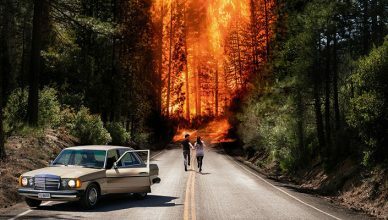 New life is everywhere, and that includes the weeds, so I turn away from silver and gold and back towards the black earth. There’s plenty of work to be done.